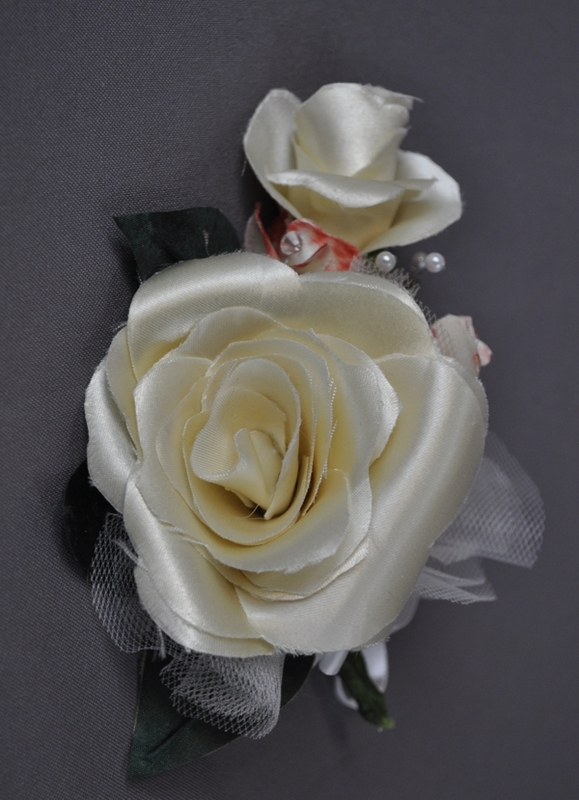 Turn a piece of your wedding dress into a beautiful corsage or boutonniere, or include a rose bud made from a loved one’s neck tie in your wedding bouquet to make the memory of that loved one part of your special day. To order, just go to our Ordering page and download the Heirloom Gifts order form. Print it off and send it, along with the garment you want used and payment to: Fairy Godmother Creations 1001 E. Second Street, Suite 3140, Dayton, OH 45402. Petal roses are made by individually cutting each petal. 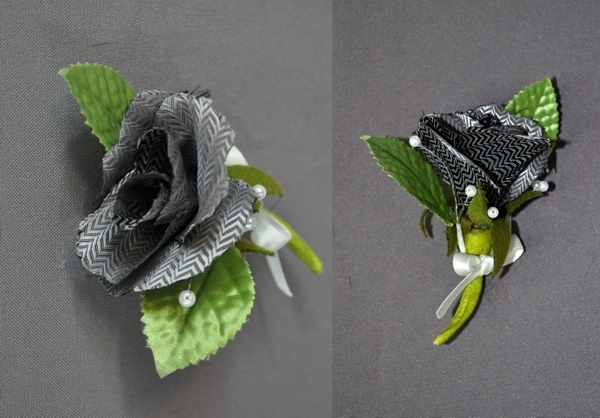 Although these are beautiful roses, they need a fabric that has some stiffness to it. 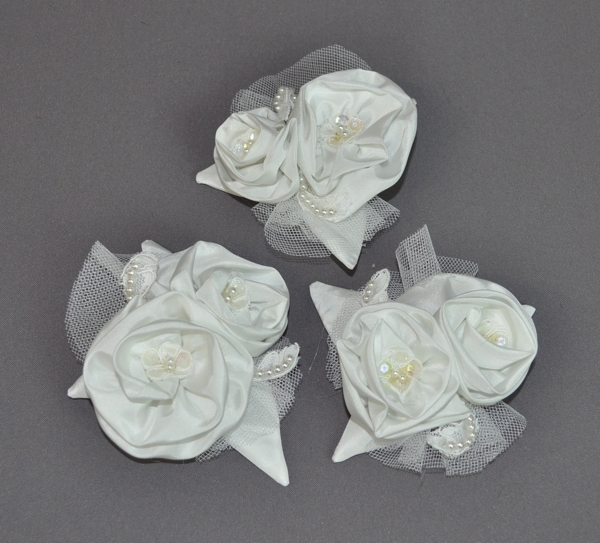 Fabrics like Satin and Silk and many of the lining fabrics found in wedding dresses are great fabrics for these roses. Just about any Neck Tie will also work. Loose fabrics with lots of drape (like chiffon and organza) and stretchy fabrics (like t-shirt fabrics) do not work well. For those fabrics, look at our gathered rosette option below. 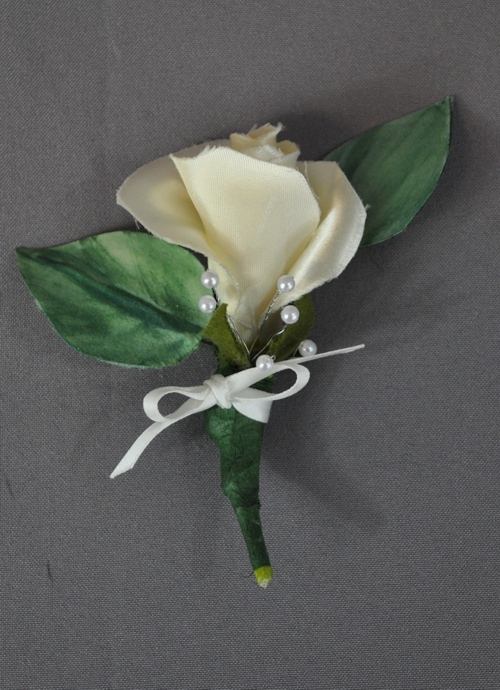 A single rose bud that can be displayed in a bud vase or incorporated into another floral element. Each bud is hand cut and assembled with two leaves. They are approximately 11″ tall. A single rose in full bloom. 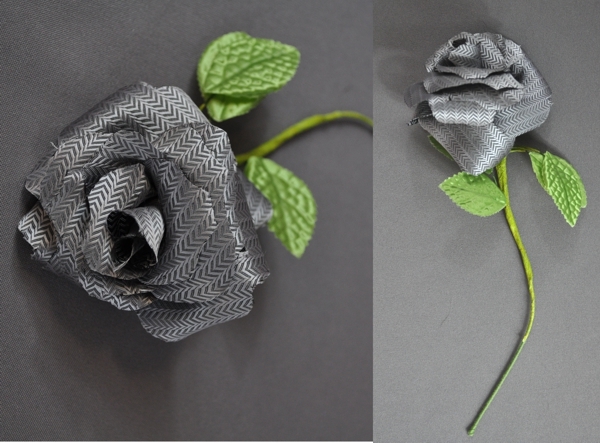 Just like our rose buds, each rose is hand cut and assembled with two leaves. They are approximately 11″ tall. 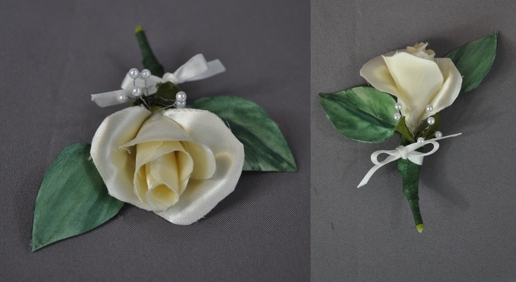 Our petal rose boutonniere includes a couple of leaves and some wired pearl beads. 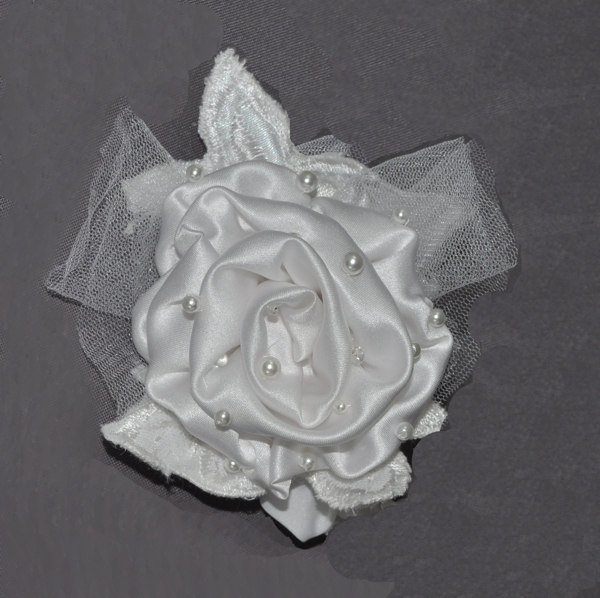 A lovely way to have a little of Mom’s wedding dress at that special occasion or Grandpa’s neck tie for Dad to wear at the christening of a first child. 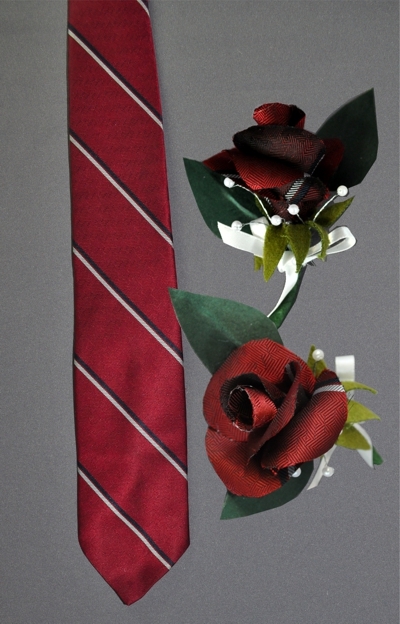 Neck Ties: We can get up to four petal rose buds or two buds and one full petal rose from a standard neck tie. Neck ties don’t work well for gathered rosettes. Wedding dress: We can get 30-40 floral elements from a standard wedding dress depending on what we are making. 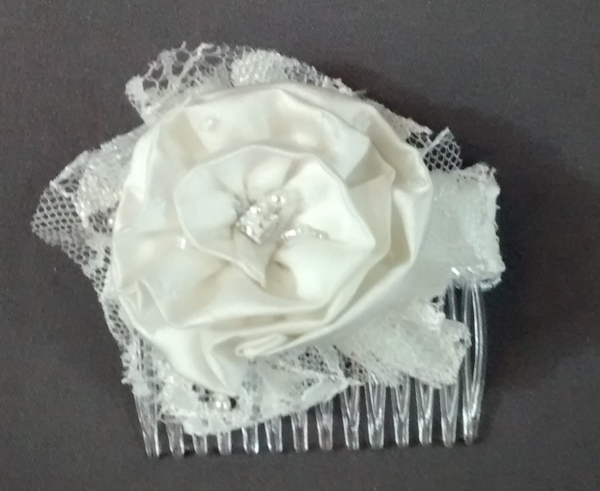 When using wedding dresses, we try to incorporate any lace or bead work elements, even netting. Blouse or shirt: We can get about a dozen floral elements from a blouse or shirt. 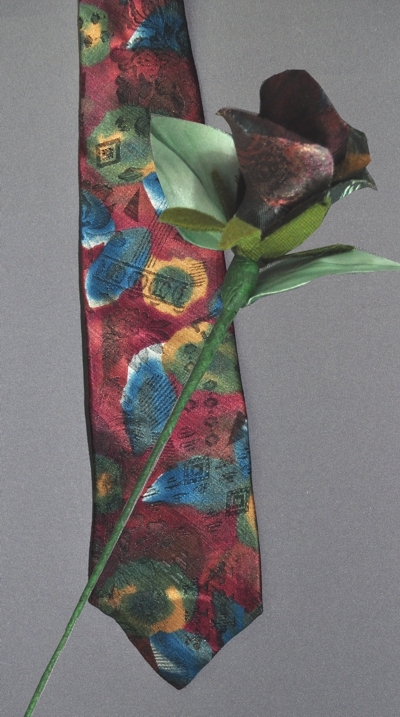 Scarf: We can get 3-6 floral elements from a satin or silk scarf. To order, just Click Here for a downloadable order form. Print it off and send it, along with the garment you want used and payment to: Fairy Godmother Creations 1001 E. Second Street, Suite 3140, Dayton, OH 45402.